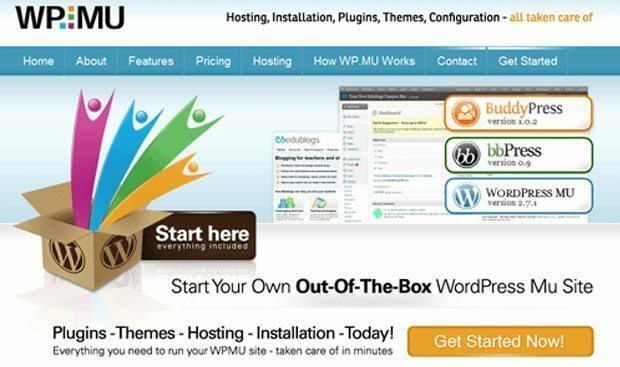 If you planning to run Multi site through WordPress, there are some steps that need to be taken in order to get everything set up correctly. It is important that you follow these steps throughly, otherwise your additional sites simply won’t work. When it comes to create or Convert WordPress into multiple WordPress sites, Look at this tutorial “How to enable Multi Site feature in WordPress 3.0?“, which tell you how to set up everything. Here is an other tutorial which tell you what you need to do to activate the multi-site ability and get through the set up and domain mapping process “How to do domain mapping in WordPress multiste network“. There is one Plugin on WordPress directory Plugin Commander, by using this Plugin you can manage all WordPress Multi Site Network Plugins at one place. After converting your site into Multi Sites Network, Follow these steps to add new sites to your network. 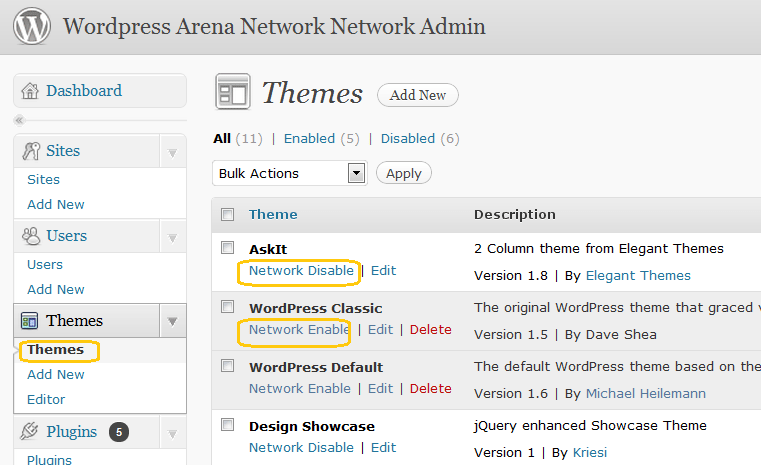 Go to Super Admin by Click on “Network Admin” at the Top right of your WordPress Admin area. 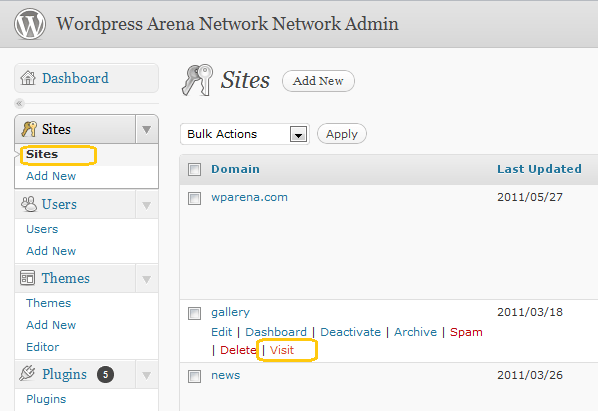 You are now in the Networking admin Dashboard, and Click on Create a New Site. Fill out all required field for your new blog, e.g. the Site Address field, a Site Title, and Admin Email. Click Add Site to finish the creation. Now you can see the new site added under Network Sites link. You can visit new site by Clicking “Visit” link on your new site. You can edit to change the setting for your new site by Clicking on “Edit” link. Aloso you can see User for this site and are able to edit them. I already have explain “How to Manage Plugins in WordPress Multi Site Network” , but there is one more excellent Free WordPress Plugin Service “ManageWP”, You can manage multiple WordPress sites by using this free service and for Self hosted WordPress this would be available soon , there’s a detail article on that Plugin on WPMU “Manage Multiple WordPress Sites from One Centralized Dashboard”, You can read all features of this service by visiting the above link. That’s all. 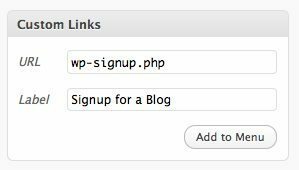 The site creation link will be available to people and they can add their email and can choose their own sub-domain.They are now ready to run a new blog by login and start blogging with all the normal WordPress features. 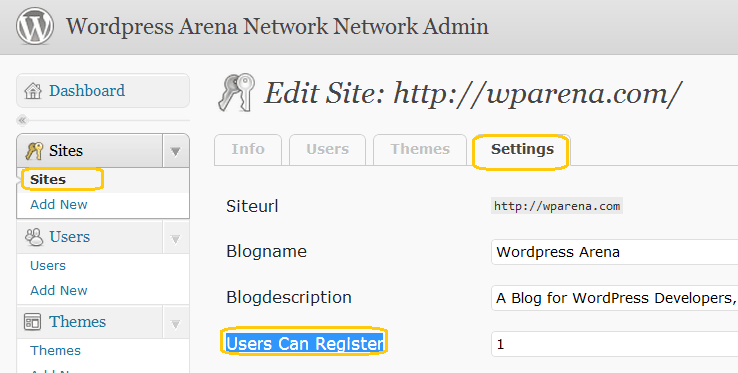 However, you can allow or disallow plugins and themes for each subsite through the SuperAdmin. Would you like 100s more of these WordPress tutorials – the same used by Apple, Sun and IBM to learn WordPress? Every day, people are building great websites with WordPress. With Open Source Training, they have access to online classes and support from the best teachers in the WordPress world. Our professional teachers have created videos and tutorials for you that walk you step-by-step through everything you’ll need to build wonderful WordPress websites . These are the same lessons we use to help clients like Apple, Sun, IBM, Hewlett-Packard and NASA. What’s Included In Your WordPress Training? Same-Day Support Unlimited WordPress questions, all answered within 24 hours. Beginner-level Class Hours of video tutorials introducing you to all the key WordPress concepts. New tutorials every week New weekly step-by-step tutorials on topics suggested by members. Intermediate-level Class Take your WordPress site to the next level with multisites, e-commerce, social networking and more.